SUBHEAD: Why poison ourselves when pesticides don’t save more of our crops than in the past? 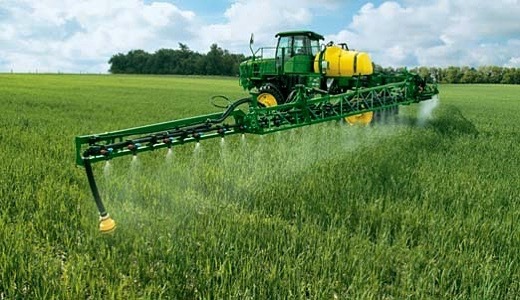 Image above: Photo of tractor applying pesticide by Sidsal - Bofarm Industries. From (http://www.sidsal.com/photogallery.php). But pest killing chemicals are surely accelerating the day of reckoning sooner rather than later. Enormous amounts of toxic chemicals are dumped on land every year — over 1 billion pounds are used in the United State (US) every year and 5.6 billion pounds globally (Alavanja 2009). Evidence also points to pesticides playing a key role in the loss of bees and their pollination services. Although paleo-diet fanatics won’t mind eating mostly meat when fruit, vegetable, and nut crops are gone, they will not be so happy about having to eat more carbohydrates. Wheat and other grains will still be around, since they are wind-pollinated. Surely a day is coming when pesticides stop working, resulting in massive famines. But who is there to speak for the grandchildren? And those that do speak for them are mowed down by the logic of libertarian capitalism, which only cares about profits today. Given that a political party is now in power in the U.S. that wants to get rid of the protections the Environmental Protection Agency (EPA) and other agencies provide, may make matters worse if agricultural chemicals are allowed to be more toxic, long-lasting, and released earlier, before being fully tested for health effects. In fact, the inevitability of resistance has been known for nearly seven decades. In 1951, as the world began using synthetic chemicals, Dr. Reginald Painter at Kansas State University published “Insect Resistance in Crop Plants”. He made a case that it would be better to understand how a crop plant fought off insects, since it was inevitable that insects would develop genetic or behavioral resistance. At best, chemicals might be used as an emergency control measure. To lower the chances of corn pests developing resistance, corn crops were rotated with soybeans. Predictably, a few mutated to eat soybeans plus changed their behavior. They used to only lay eggs on nearby corn plants, now they disperse to lay eggs on soybean crops as well. Worse yet, corn is more profitable than soy and many farmers began growing continuous corn. Already the corn rootworm is developing resistance to the latest and greatest chemicals. Before planting, farmers try to get rid of pests that survived the winter and apply fumigants to kill fungi and nematodes, and pre-emergent chemicals to reduce weed seeds from emerging. Even farmers practicing no-till farming douse the land with herbicides by using GMO herbicide-resistant crops. Then over the course of crop growth, farmers may apply several rounds of additional pesticides to control different pests. For example, cotton growers apply chemicals from 12 to 30 times before harvest. The demand for chemicals has also grown due the high level of bioinvasive species. It takes a while to find native pests and make sure they won’t do more harm than good. In the 1950s there were just three main corn pests. By 1978 there were 40, and they vary regionally. For example, California has 30 arthropods and over 14 fungal diseases to cope with. When I was learning how to grow food organically back in the 90s, I remember how outraged organic farmers were that Monsanto was going to genetically engineer plants to have the Bt bacteria in them. This is because the only insecticide organic farmers can use is Bt bacteria, because it is found in the soil. It’s natural. Organic farmers have been careful to spray only in emergencies so that insects didn’t develop resistance to their only remedy. Since 1996, GMO plants have been engineered to have Bt in them, and predictably, insects have developed resistance. For example, in 2015, 81% of all corn was planted with genetically engineered Bt. But corn earworms have developed resistance, especially in North Carolina and Georgia, setting the stage for damage across the nation. Five other insects have developed resistance to Bt as well. “Ultimately the practice of modern farming is not sustainable” because “the damage to the soil and natural ecosystems is so great that farming becomes dependent not on the land but on the artificial inputs into the process, such as fertilizers and pesticides. In many ways, our battle against the diverse array of pest species is a battle against the health of the system itself. As we kill pest species, we also kill related species that may be beneficial. We kill predators that could assist our efforts. We reduce the ecosystem’s ability to recover due to reduced diversity, and we interfere with the organisms that affect the biogeochemical processes that maintain the soils in which the plants grow. Soil is a complex, multifaceted living thing that is far more than the sum of the sand, silt, clay, fungi, microbes, nematodes, and other invertebrates. All biotic components interact as an ecosystem within the soil and at the surface, and in relation to the larger components such as herbivores that move across the land. Organisms grow and dig through the soil, aerate it, reorganize it, and add and subtract organic material. Mature soil is structured and layered and, very importantly, it remains in place. Plowing of the soil turns everything upside down. What was hidden from light is exposed. What was kept at a constant temperature is now varying with the day and night and seasons. What cannot tolerate drying conditions at the surface is likely killed. And very sensitive and delicate structures within the soil are disrupted and destroyed. Conventional tillage disrupts the entire soil ecosystem. Tractors and farm equipment are large and heavy; they compact the soil, which removes air space and water-holding capacity. Wind and water erosion remove the smallest soil particles, which typically hold most of the micronutrients needed by plants. Synthetic fertilizers are added to supplement the loss of oil nutrients but often are relatively toxic to many soil organisms. And chemicals such as pre-emergents, fumigants, herbicides, insecticides, acaricides, fungicides, and defoliants eventually kill all but the most tolerant or resistant soil organisms. It does not take long to reduce a native, living, dynamic soil to a relatively lifeless collection of inorganic particles with little of the natural structure and function of undisturbed soil”. There is far too much money to be made in the chemical herbicide, pesticide, and insecticide industry to stop this juggernaut. After reading Lessig’s book “Republic, Lost”, one of the best, if not the best book on campaign finance reform, I despair of campaign financing ever happening. So chemical lobbyists will continue to donate enough money to politicians to maintain the status quo. Plus the chemical industry has infiltrated regulatory agencies via the revolving door for decades and is now in a position to assassinate the EPA, with newly appointed Scott Pruitt, who would like to get rid of the EPA. About half of farmers are hired guns. They don’t own the land and care about passing it on in good health to their children. They rent the land, and their goal, and the owner’s goal is for them to make as much profit as possible. Renters and farmers both would lose money, maybe go out of business in the years it would take to convert an industrial monoculture farm to multiple crops rotated, or an organic farm. It takes time to learn to farm organically properly. So even if the farmer survives financially, mistakes will be made. Hopefully made up for by the higher price of organic food, but as wealth grows increasingly more unevenly distributed, and the risk of another economic crash grows (not to mention lack of reforms, being in more debt now than 2008, etc). Industrial farming is what is taught at most universities. There are only a handful of universities that offer programs in organic agriculture. Subsidies favor large farmers, who are also the only farmers who have the money to profit from economies of scale, and buy their own giant tractors to farm a thousand acres of monoculture crops. Industrial farming has driven 5 million farmers off the land who couldn’t compete with the profits made by larger farms in the area. But farmers will have to go organic whether they like it or not. It’s hard to say whether this will happen because we’ve run out of pesticides, whether from resistance or a financial crash reducing new chemical research, or whether peak oil, peak coal, and peak natural gas will cause the decline of chemical farming. Agriculture uses about 15 to 20% of fossil fuel energy, from natural gas fertilizer, oil-based chemicals, farm vehicle and equipment fuel, the agricultural cold chain, distribution, packaging, refrigeration, and cooking to name a few of the uses. Although steam engines could replace diesel and gasoline engines, steam engines are far less efficient, and biomass doesn’t grow quickly enough to be renewable for a steam engine economy. By the civil war, vast regions of the U.S. east of the Mississippi were deforested for steam locomotives, factory steam engines, river boats, and for heating, cooking, and construction. It is unlikely we can electrify tractors – the weight of the battery needed would be about as much as the weight of the tractor, and further compact the soil. Diesel is 500 times more energy dense pound for pound as a led acid battery, and 100 times as energy dense as lithium batteries. Batteries also weigh a lot because half the weight of a battery is its management system, which uses half of the battery energy to keep the batteries from exploding or getting too hot or cold. Published by Island Press. Link is to Amazon access to book.